Top Notch Material: With the Help of Swimways Products, My Children are Becoming More Confident in the Water! With the Help of Swimways Products, My Children are Becoming More Confident in the Water! Summer is here which means lots of water for my little guys! I wrote a couple posts in the past about some fabulous products we received from Swimways and the three steps to learning to be a competent swimmer. As the summer progresses I thought I should share them with you again, and let you know how my children are doing with the product provided. While it is not my youngest sons first time in the pool, he probably does not remember last summer when we took him in. He is only 15 months so this summer will feels like a new experience for him. The Baby Spring Float Sun Canopy that we received for review is excellent for him. He feels safe and protected in the water, and also from the blazing sun. My little man absolutely loves floating around the pool in his float, and I love how easy it is to fold back up into the storage bag for travel! 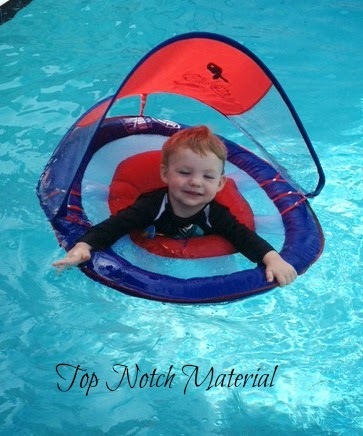 As you can tell from his smiling face he is completely happy to be in the water with his float sun canopy. I love this device for two very important reasons! The first is because it offers more stability for my little guy than any other baby float we have had, and the second is the canopy. This canopy adds more protection from the sun then the typical plastic baby sun canopy floats do! He is really protected under this, which is important to me because my little guy is SUPER pale!! We used this quite a bit during our vacation and I became more and more impressed every time we used it! At around $39.99, it is well worth it because it is very well made, and I know it will last for years to come! With the help of Swimways, my little guy is becoming more confident in the water, and his fear of swim time has decreased. He is now enjoying pools. This is the stage where my oldest is. He is somewhat independent in the water, but I by no means feel comfortable with him in the deep end. We received the Sea Squirt Swim Assist Vest. The cool thing about this vest is, parents cane remove the flotation panels according to how much assistance your child needs. Not to mention kids just love the super cool fin design. When we first received this, my son was running around the house pretending to be a shark! He absolutely loves the fin! 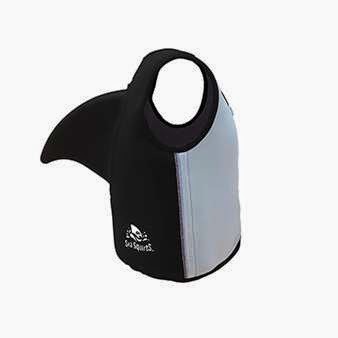 This super soft and really comfortable vest allows him to achieve the proper posture to become a strong swimmer! At this point my little man is only using one of the flotation devices in the vest and managing the pool pretty well. He still stays close to the wall but it making progress and becoming more confident and independent. I love how well made this is. Not only is it incredibly functional with the three removable panels, but the style allows my little guy to feel cool and like a shark when he wears it! The above item was received by Paige as part of the Swimways ambassador program in order to facilitate the review. Top Notch Material blog will always provide honest opinions, beliefs or experiences on products reviewed. If you have any questions, please contact me at nursemommypaige at yahoo dot com. The disclosure is done in accordance with the Federal Trade Commission 10 CFR, Part 255 Guides Concerning the use of Endorsements and Testimonials in Advertising.